This proclamation is pretty on the nose, it could almost serve as the logline for the film, and can be used to fuel the fire for those who love to hate Citizen Kane’s exceptionalism. There are bloggers and forum commentators who work tirelessly trying to find story holes and bland dialogue in the work, much like a younger sibling tries to find flaws in a prodigal older sister. But like the SAT scores, thesis papers, and achievements of the genius sister, this film has plenty to back its rightful acquisition of the #1 spot. The color scheme of black and white (echoing the color scheme of the newspaper) is unparalleled in its vividness. The cinematography is innovative, using unexpected fish-eye lenses and long bold panning shots and crane shots, mixed with bold editing, cutting from newsreel footage to flashbacks, to current day, taking the viewer in and out of the newsrooms and bars, and back to Xanadu. While the writing can be overly self-aware, self-serious and heady, the dialogue is that of poetry, with moments of tremendous eloquence and others of raw pain. The story moves and feels fresh, perhaps giving some historic insight into our current era of fake news and reality star presidents. Even with its grandiose reputation, watching Citizen Kane feels very personal, especially on the small screen of my laptop on an evening Amtrak ride through the New England winter. A friend of mine recently told me that when we are at a crossroads in our life, we tend to think everything is speaking directly to us. Maybe that’s why I was looking at waspy, white male Kane with a level of intimacy often reserved for Winona Ryder and Greta Gerwig films. Perhaps it reminded me of my own pursuits for “Rosebud’s,”and the puzzle-pieces in all of our lives that go unfound. Friends, it seems that we have approached the end of this year-long series, going through the Top 10 list of the American Film Institute’s 2007 (and most recent) list of the Greatest American Films of All Time! It’s been quite a journey, and has been such a joy to write and share geekdom with all of you. It is with great joy and triumph that I present the final essay on my AFI series, number #1, Citizen Kane. Citizen Kane starts where many films end, with the death of the protagonist, where we find the old man in his compound Xanadu, feeble and pasty, and clutching a snow globe, uttering his last word before death,”Rosebud.” And then there’s a sudden cut to a 10 minute news real about his life, explaining his humble beginnings in Colorado, his transformation of the New York Inquirer into the most important paper in the country, his first marriage, his affair, the fall of his political career, his second marriage, his move into his estate titled “Xanadu,” the ending of his second marriage, and his lonely death. The reel cuts out, and we are stuck in a dark room with a bunch of faceless reporters, cynical about what they just saw. Rawlston, the editor, fixates on Kane’s last words “rosebud,” and assigns the journalist, Thompson to take on the challenge. Thompson interviews four primary people in Kane’s life: his manager Mr. Bernstein, his ex-best friend and colleague Jedediah Leland, his second ex-wife Susan Alexander Kane, and finally, his butler, Raymond. They each reveal a fuller picture of the complicated nature behind Kane, albeit with their specific biases. In the fuller puzzle of his life, Kane’s mother exchanged her rights to a gold mine for her son to live with the banking tycoon Walter Parks Thatcher, who Kane always resented and “gagged on the silverspoon.” When he became “of age,” he decided to take on Thatcher’s sleepy and failing New York Inquirer, which he and his partner Jedediah Leland revamped into the tabloid-esque-paper-of-the-people newspaper (see AP US History: yellow journalism) that sold like hotcakes. When he settled down, he did it in style, marrying the President’s niece, Emily Norton. Their marriage was mostly loveless and filled with rue, and Kane started an affair with a child-like, naive, aspiring singer, Susan Alexander. Word of this scandal destroyed his political career and his marriage. Kane marries Alexander, making her his newest pet project. He builds an opera house for her to star in, much to Alexander’s bad reviews and increasing misery. Only after a suicide attempt does Kane stop pushing her, and instead builds a beautiful estate for them in Florida called “Xanadu.” It’s not enough for Alexander, and she leaves him. Thompson decides to travel to Xanadu himself, which is now being sold. Thompson shrugs off this unsolved mystery, telling the reporters it’s time to head home, never knowing what Rosebud meant to Kane. The camera zooms in on a pile of Kane’s things being thrown into the fire. Among those things is a childhood sled from his youth in Colorado, before he got shipped away, and when life was happy and easy, with the word”Rosebud” on it. 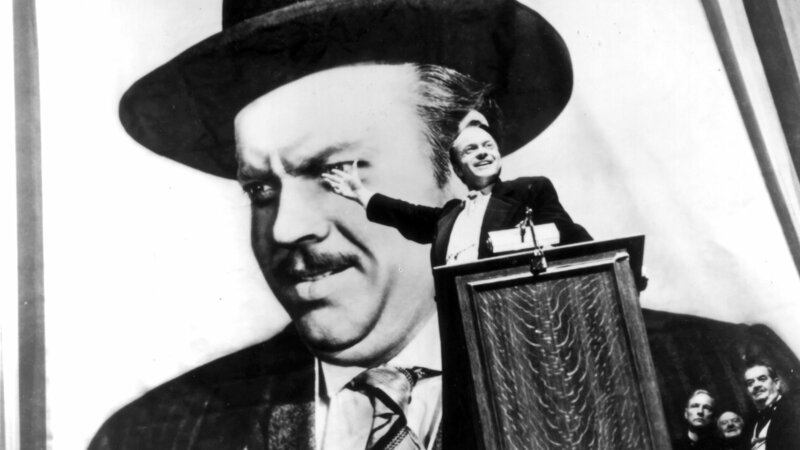 There are many great pieces written about Kane serving as a symbol for America, and of the major importance of director and star, Orson Welles. Heavily inspired by the lives of William Randolph Hearst and Joseph Pulitzer, Welles wrote Kane to be one of the new age, post-industrial revolution, rise of mass-media millionaires. The man solely responsible for the cheapest and most valuable commodity, media. Kane himself is a pure roll of passion, acting as a populist or elitist whenever it suits him. Many times during the film he states his Americanness, stealing a line from FDR that he is neither a communist nor a fascist, simply “an American.” Perhaps this is Welles’ cynical view of the country in which he is a part, one so taken by words and perception of America, that the promise and desire of its youth is forgotten, and the morals and integrity are compromised by public perception. This is who Kane embodies, dying with a memory of what it was like in his youth. While this is a convincing enough interpretation of Kane’s main character flaw, I want to zero in on a retort of Susan Alexander in their last blow-out fight before she left him. She complains that he tries to buy his way through life and about his attitude of “whatever you want – just name it and it’s yours! Only love me!” She turns to him and says “Don’t expect me to love you.” He slaps her at this admission. Perhaps it’s because, for the first time, Susan seems to be making too much sense. It’s the typical story, a man who has everything in the world but the one priceless thing, love. It suddenly becomes a story about a big man, the “most American,” in pursuit of a small thing. His final word is not dissimilar to modern films like The Social Network, with Mark Zuckerberg, at the end refreshing his facebook page, hoping his ex-girlfriend will finally friend him back. But, unlike these classic tropes, I see that there were actually multiple times in Kane’s life where love was within his reach, where people like Thatcher, Leland, and his wife, Emily did love him, but were never enough. In fact, he tested each of these loves until they were worn out and non-existent. Thatcher, not unlike Kane, tried to buy little Charlie’s love, sending him to the finest schools, handing him any of his businesses to run, but Kane turned to resent him, saying he always wished to be “everything Thatcher hated.” Second to Thatcher, there was the love of his school friend, Jedediah Leland, who seemed to have fallen for the idealistic entrepreneur Kane of his youth. Kane wrote a manifesto for the the Inquirer, promising to commit the paper to telling the whole truth, holding with the ideologies of his youth. Leland ultimately feels disillusioned when he sees how easily Kane sold out for politics, love, and his own self-image. He wasn’t a man that stood for anything, and eventually Kane fired Leland for publishing a brutally honest review on Susan Alexander’s performance. The last point is that his first wife started out loving him, until she realized that his true love belonged to the newspaper, stating that she would prefer “a rival of flesh and blood” over his dedication to the paper. He ultimately chooses his work over her. For him, the the only love that seemed to count was an unconditional devotion, they needed to be completely and utterly devoted to him in order for him to feel real love. To him, it’s 100% or nothing, and unfortunately he receives nothing from them, they cannot become another slave to his cult of personality. Of course, there is one woman who could give him this unconditional love, his mother, Mary Kane. But, alas, her love for her son remains ambiguous. She seems to have given him up for his own benefit of success, and further speculation to keep away from an abusive father. But it almost doesn’t matter if she loved him or not, because it was never enough for Kane, nothing ever seemed to be. While I look at Kane with pity and disdain, the ultimate privileged person unable to see the affection around him, how so many wanted him, but weren’t willing to give him their entirety… I also find myself trying to grasp at everything and nothing. There’s an overwhelming need for unconditional devotion and love, and anything less than that, for Kane, seems impure. It is addictive, the feeling that perfection is beyond our reach, and that if we navel gaze enough we will reach the center of the universe. We are all stuck in our own snow globes, waiting for the snow to part. Rachel Olshin is a production assistant, TV elitist, mason jar frequenter, “Gerwy”, and member of the Teaneck Public Library. If asked how’d she spend an ideal day, she’d say helping humanity and running on the beach, but really, she’d prefer watching Heathers on loop and consuming large amounts of mac n cheese.